This is the closest we get to rhinos around here. 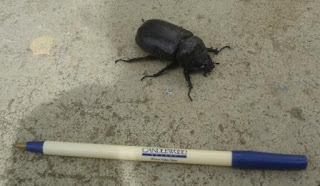 A rhinoceros beetle. This fellow was so big I couldn’t believe it. I tried to photograph him with something to give you an idea of his size. He got flipped onto his back and was waving his legs around for quite some time before I took pity on him and flipped him back over. I guess he was so tired from his little ordeal that he let me snap a few pictures before he ran off.